Montessori is where children are allowed to do whatever they want to do as long as they are happy and are ‘expressing’ themselves. Montessori is very rigid, children have to do things in a certain prescribed way. Montessori does not encourage social development since children have to work alone. 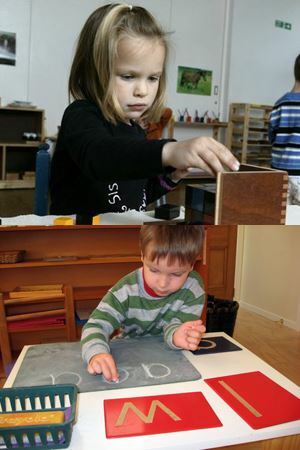 Montessori children are forced to work and are not allowed to play. Montessori does not allow children to be creative. The truth, of course, is that none of the above is the truth! Montessori education is designed to support the natural development of children from birth to adulthood so it is not just nursery education but takes the child right through secondary school too. It is founded on the belief that within the human being there is an enormous untapped potential that needs a fertile environment and a different educational approach from the teacher in order to be fully expressed. Great focus is given to the formation of the child’s fundamental capacities during the first years of life - not just intellectual capacity but also the development of a strong character. If a child can think clearly and logically, concentrate and persevere he will be able to learn to read and to write, to do mathematics and to learn about the world. If a child can communicate and live well with others, taking into account the needs of others the social problems of his generation will be solved. Children who have been given the right kind of support during these formative years grow into children who are self-motivated and love learning, can think flexibly and creatively and who are not only conscious of the needs of others but actively foster harmony within their peer groups. In traditional education children are given a diet of facts dictated by an adult-led curriculum and are tested to see how much they have retained. The ability to retain information is then given a test score, which is used as a measure of academic success. All children are assumed to have the same learning style and have equal capacity to achieve certain standards. In this model the teacher is active and the child is the passive receiver of information. In the Montessori approach the teacher takes on a different role, that is, to guide rather than teach, so the child becomes the active learner and the teacher the passive facilitator. The Montessori curriculum is child-led.